Did the builders of Wansdyke ever use the Roman Road? Here, east of the Avon, there can be no substitute. And worse, the course of the road is lost on the flanks of Bowden Hill. We can retrace it only through Spye Park, as it converges on Sandy Lane, once the small Roman town (station) of Verlucio. From here, it runs to Morgan's Hill, the point were Wansdyke branches off. By car from the direction of Melksham. From Melksham: follow the A 3102 to Calne, and the A 342 to Chippenham. Go right at Wans House, where you best park the car. Right across the farm buildings is the agger, the bank which forms the Roman Road. It should be visible west of the main road, crossing a field right into the woods of Spye Park. Alternatively from Melksham: follow the A 350 to Chippenham, and at Lacock go right. At this point, Id recommend a visit to the beautiful medieval site of Lacock Abbey. 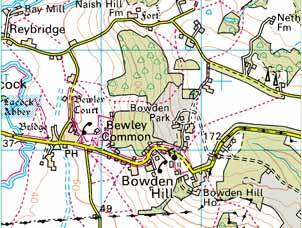 Anyway, continue to Bewley Common and Bowden Hill, from where a very steep ascent will take you out of the Avon valley. The road now leads you north of Spye Park and to Sandy Lane, where you very briefly follow the A 342 south before going left at Wans House, and continue as described above. By car from the direction of Chippenham. From Chippenham: take the A 342 to Calne and takes you past Sandy Lane, after which you must turn left at Wans House, and continue as described above. Alternatively from Chippenham: take the A 350 to Melksham, but turn left before Lacock to Reybridge, which was the medieval Avon crossing of the London-Bath main road. Continue uphill, on top of which lies Naish Farm, which occupies the site of a former hillfort. This site has the most wonderful views across the Avon valley, and can be spotted from the Cotswolds as well as the Mendips. The minor road which continues to Sandy Lane may, hypothetically speaking, be the route on which one should look for Wansdyke IF it once ran here from the Avon to Morgans Hill. Arriving at Sandy Lane, youll very briefly follow the A 342 south before going left at Wans House, and continue as described above. By car from the direction of Devizes. Take the A 342 to Chippenham, Go right at Wans House, where you best park the car, and continue as described above. By car from the direction of Calne. Follow either the A 4 to Chippenham, or the A 3102 to Melksham, but take the A 432 from either side once you reach it. Continue to Wans House, then continue as described above. 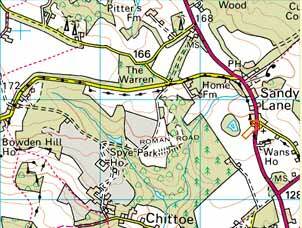 Point 6.2: An alternative: Naish Hill? I cannot but wonder why the builders of Wansdyke did not use the hillfort at Naish Hill. It is a vantage point that has views from the Mendips to the Cotswolds, and even when the Roman Road went out of use, the coaches still passed by this point on their way from London to Bath. The lane that runs from here to Sandy Lane, could have been the ditch of Wansdyke. Who knows? By car from Swindon. Follow the A 4361 to Wroughton and on to Avebury. You will drive right through the ancient Stone Circle and a visit can only be recommended! Drive to Avebury through the roundabout, then take the A 4 to Cherhill (there's a nice White Horse on the hillside to your left), and on to Quemerford. Take the road left (just before the Leisure Centre) to Stockley. Drive on through the village, where opposite the driveway of Harley Farm you'll find the footpath which is the Roman road, going west. From the village itself there's a footpath towards Morgan's Hill and Wansdyke. Best park the car there somewhere in the village. By car from Calne and Chippenham. Follow the A 4 to Quemerford. Take the road to Stockley, then continue as described above. By car from Devizes. Follow the A 361 to Avebury and Swindon, but after you passed Bishops Cannings, take the first road left. The first crossing after you've passed some cottages (but continue on!) will be the Old Bath Road, the medieval alternative of the Roman Road. To your left is the 1643 Civil War battlefield of Roundway Down. When you passed the golf course, you'll reach the Morgan's Hill picnic site. 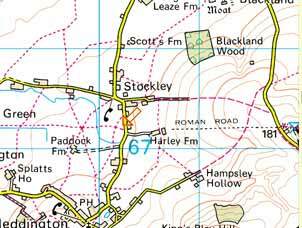 Continue through the hamlet of Blackland, take the road left and at the next crossing left again to Stockley, and continue as described above. Alternatively, if you don't mind a good walk, park the car at the picnic site and walk west across the foopath to Stockley. By car from Marlborough. Follow the A 4 towards Avebury and Quemerford, then continue as described above. This part of section 6 is the best part of the Roman road east of the river Avon. East of Spye Park, the course of the Roman road is found again and becomes a good footpath from Bell to Stockley across Broad's Green. From Stockley, the path follows a course to the north of the road, and after a mile crosses the road opposite to the Morgan's Hill picnic area, just short of the point were East Wansdyke disengages itself from the Roman road. click here to return to 'Mid' Wansdyke, section 6.